Evening rose. Carmine crimson. A duality of colours, our twofold experience of Albarracín, Spain. Evening rose in the labyrinth of medieval buildings in the town. 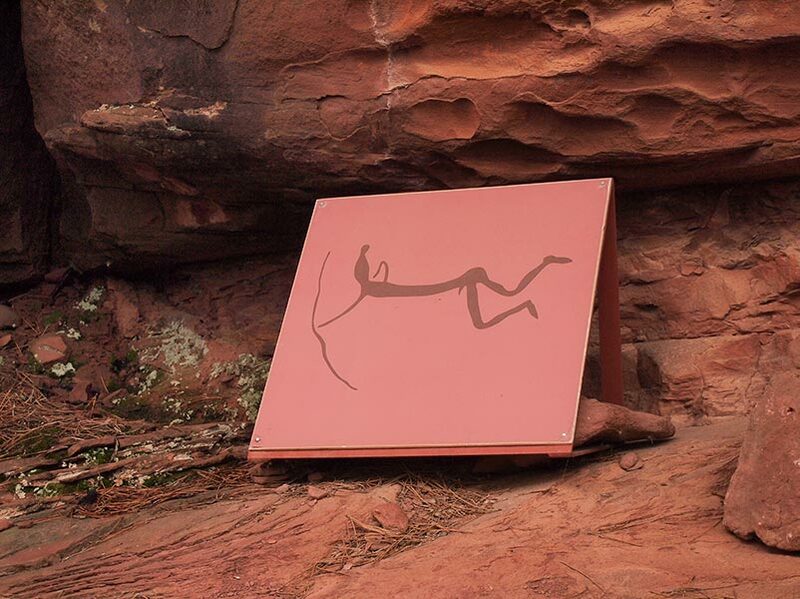 Carmine crimson in the Stone Age rock-art in Albarracín Cultural Park. 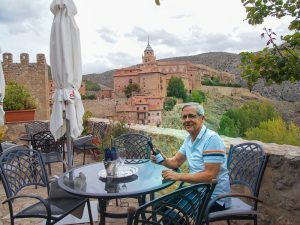 It was Marc and Anne, a Belgian couple we met on our first trip to Spain, who recommended Albarracín. 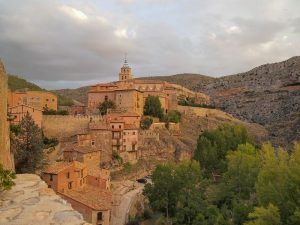 “It’s the most beautiful town in Spain,” Marc said, along with telling us about its cave art. 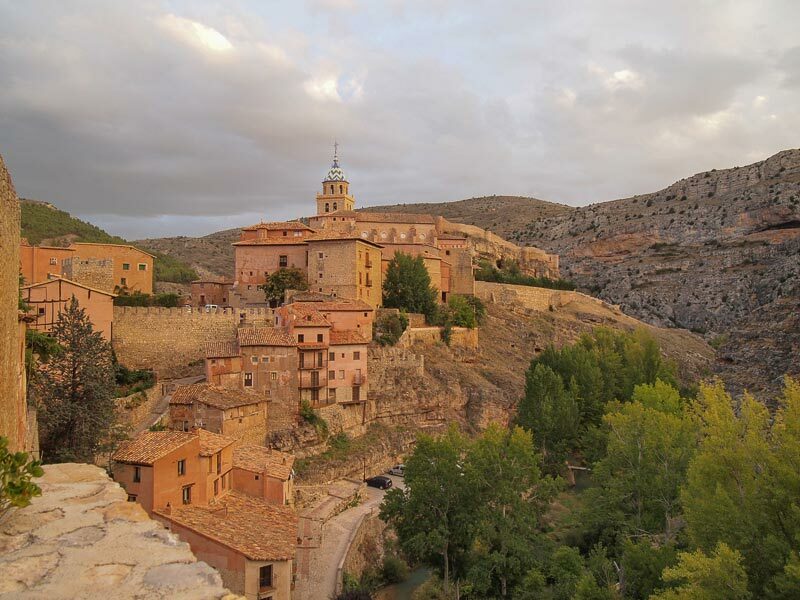 Perched in the Sierra de Albarracín at 1200 metres, the town is encased in a gorge surrounded by barren hills. 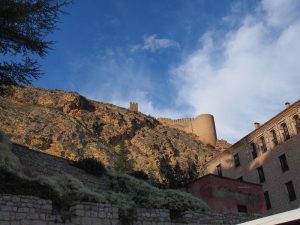 Jagged ramparts of stone curve grandly up to the top, then swoop down the other side of town. Buildings cluster in a monotone shade of evening rose, evoking the melancholy of a Sunday afternoon. Which it was, ironically, when we arrived and parked our rental car. The town was quiet as stone, only a handful of cats silently meandering the cobblestone. About 1,000 people live here, but most are summer residents and it was late September. 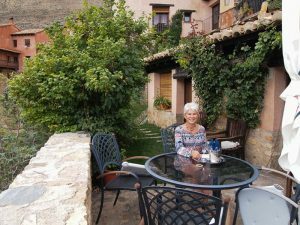 We found our way to the tiny Casa del Tio Americano, run by Angelina and her brother, assisted with the charm of Carmen, Angelina’s six-year-old daughter, and their cats. 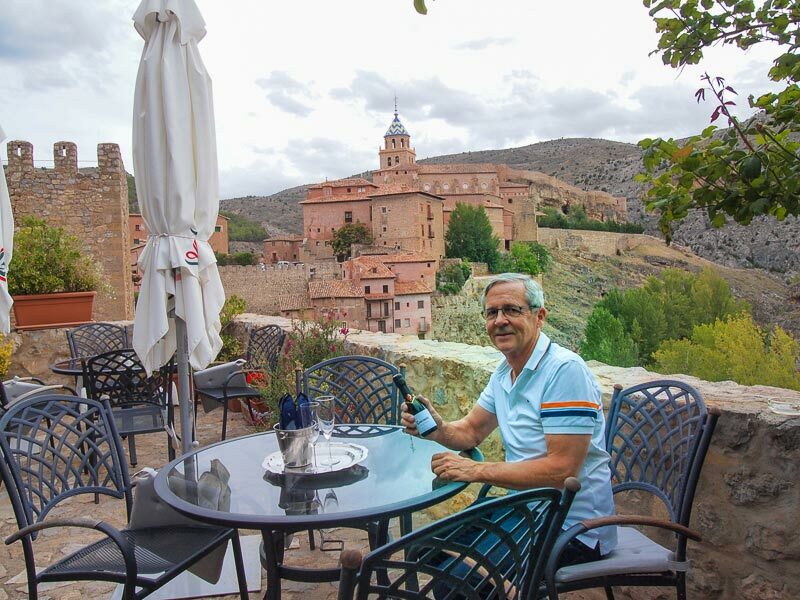 We didn’t take Angelina’s advice and go to El Molino del Gato (Gato is Spanish for cat), a bar owned by her husband and brother in the town’s prime location directly over the river, opting instead for wine on our balcony with its own vertiginous view. 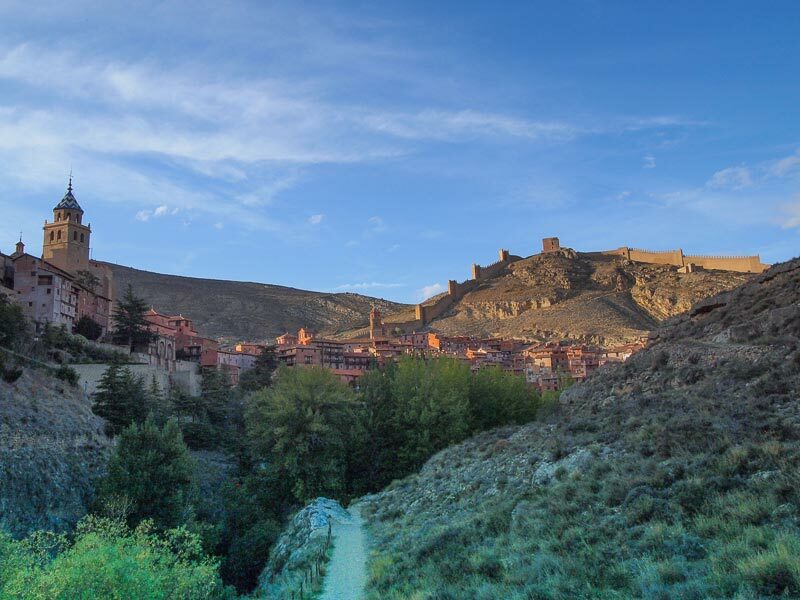 Meadows of green and rivers of blue surrounding Albarracín gave life to an abundance of wild game that attracted people back in the Stone Age. A walk along the Río Guadalaviar is how we decided to spend the day’s last hours of light. Magellan was interested in the aqueduct, eighteen kilometres long, one of the most complex Roman projects in Spain. 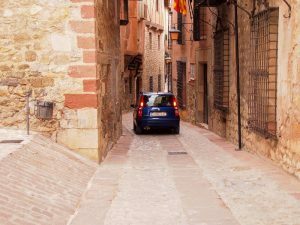 Were there squatters in Roman times, we wondered, like the people we saw that afternoon getting water from the Guadalaviar and picking wild fruit? The town was most prosperous during the middle ages when Moors, Jews and Christians lived together peacefully. Archeologists found a set of surgical tools indicating that during this time period, local surgeons operated on cataracts! 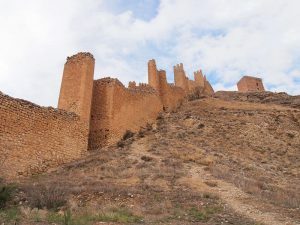 After the Spanish Civil War, Albarracín was in ruins. Even though it’s in what’s called “No Man’s Land,” the local authorities decided to rebuild in the old, authentic tradition. Smart. 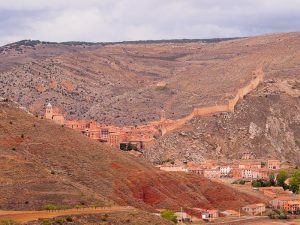 Albarracín was declared a National Monument in 1961 and has been awarded nationally and internationally for the quality of its preservation. And with that comes good restaurants, like Tiempo de Ensueno, a guilty pleasure after what we’d seen earlier. 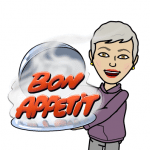 The food was a mélange of the ages: a soup of cereals and legumes, sesame pasta sauce, roast lamb with Ras al Hanout. 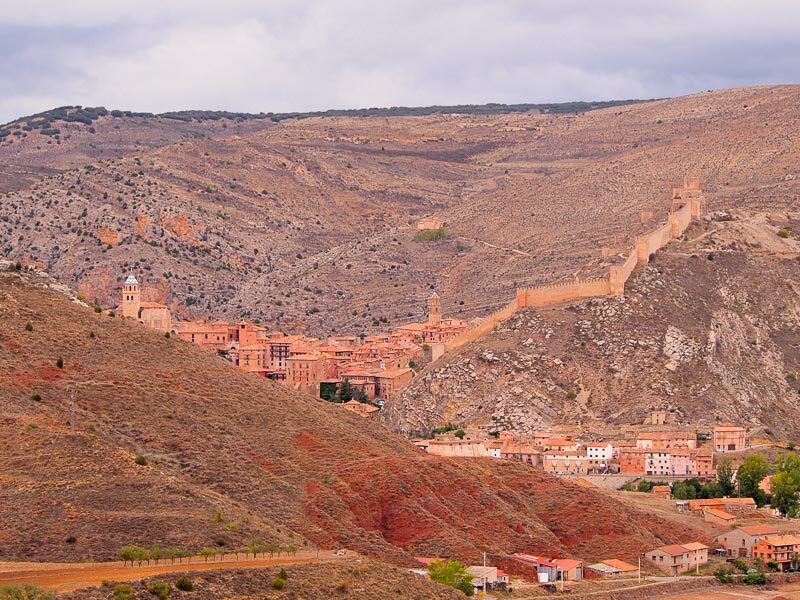 But it was the carmine crimson of art from as far back as 9600 BC that we saw the next day at Albarracín Cultural Park—one of the greatest concentrations of post-Palaeolithic art in Europe—that entranced us even more than the town itself. 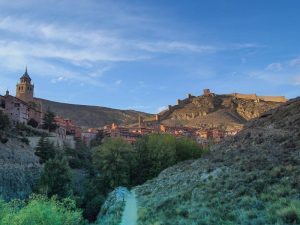 Albarracín Cultural Park, lush and green in stark contrast to the town, was declared a World Heritage site by UNESCO in 1998. 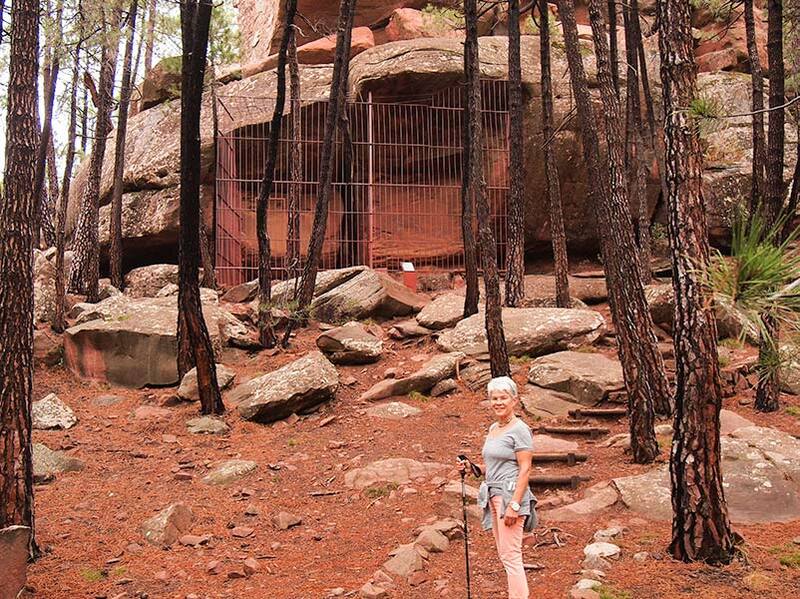 We set off on a fifteen kilometre hike that started just outside town through a protected forest of Rodeno Pines. It’s not a well-used trail. 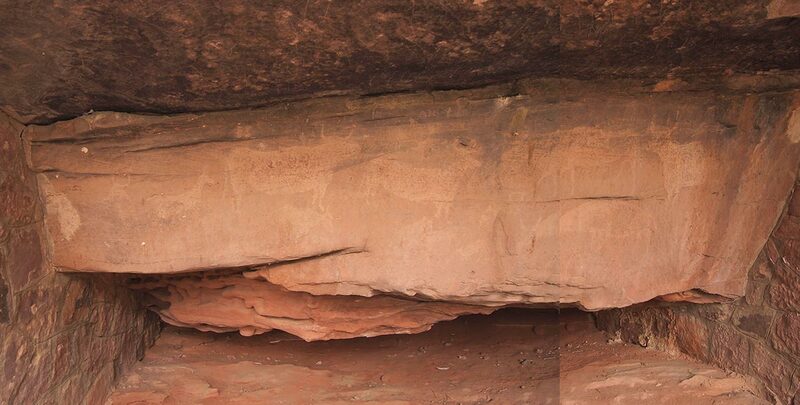 And it’s a bit of a slog to the first signposted rock art. Then the “Oh wows” start. 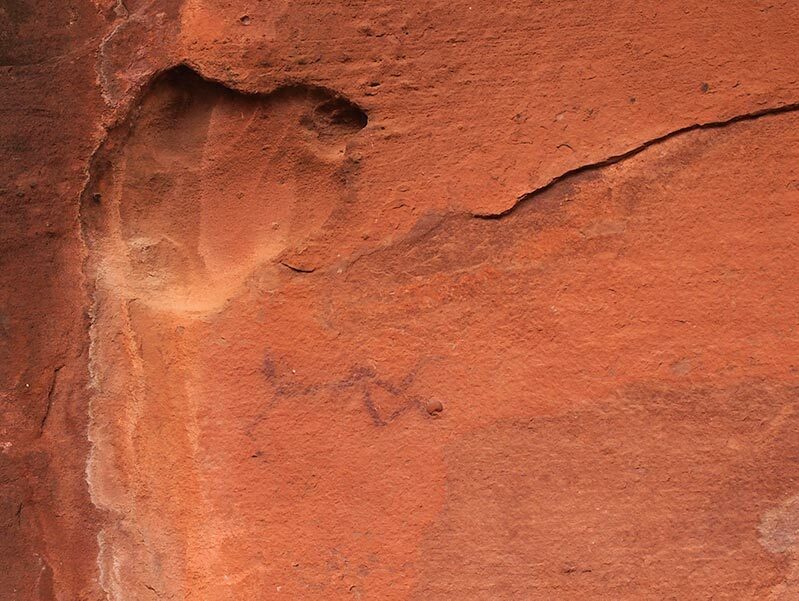 As a man we met on the trail said, this is the great-grandfather of art. 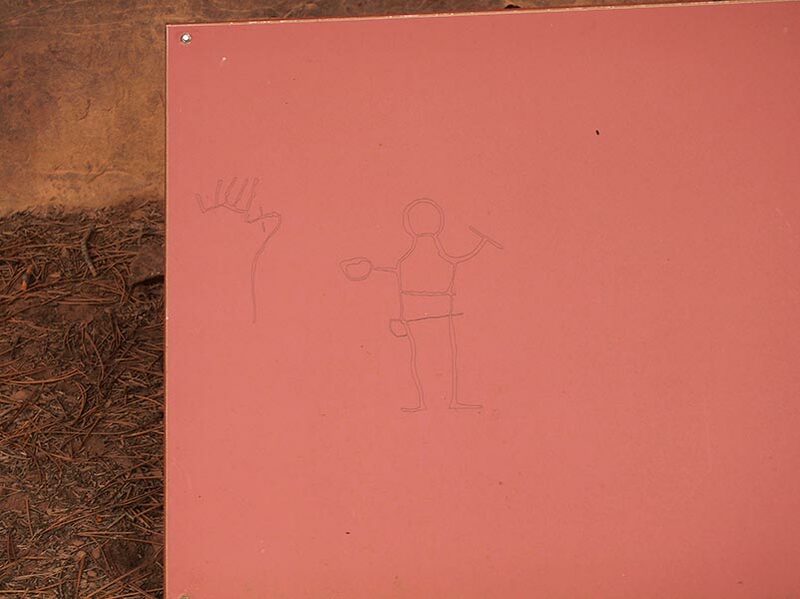 The UNESCO folk have enriched the sites with interpretative panels of how the art would have looked when a Stone-Age artist stepped back from the limestone wall and recognized her piece was complete. 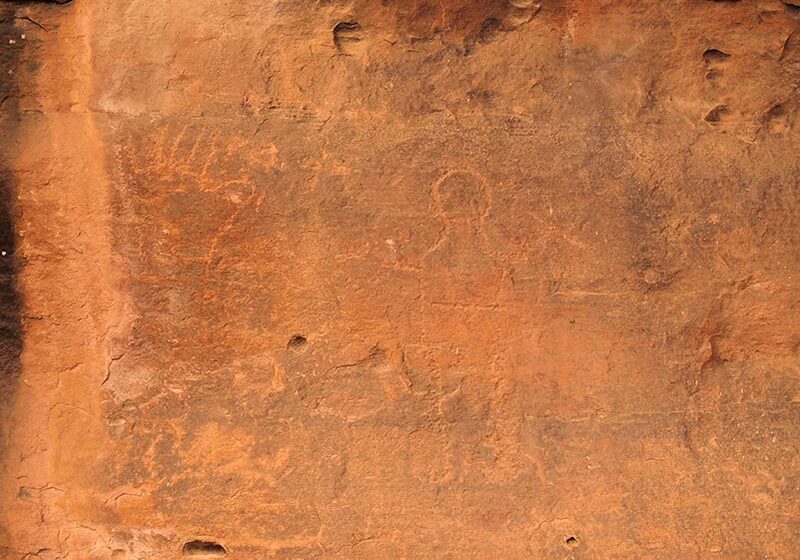 There are both Levantine themes (archers, hunting and gathering scenes, naturalistic depictions of animals with colour-wash) and motifs of Iberian Schematic art (anthropomorphs, zoomorphs and signs). Even the sites that conserve only a few figures are impressive. 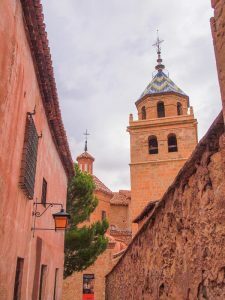 Many of the panels are large (nine metres for Callejones Cerrados) with multiple figures (forty-three on Medio Caballo). 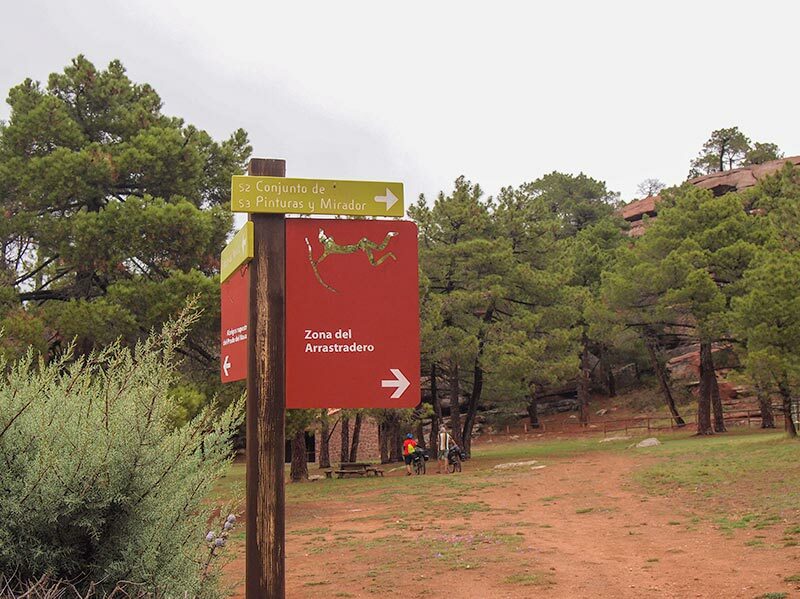 We were amazed to see only eleven people on the trail. Yet thankful for the solitude of the experience. 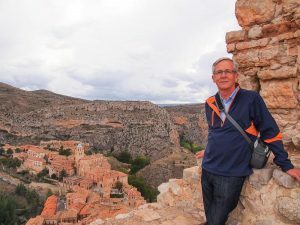 The intoxication, at once so heady and so devout, is not the romantic melancholy engendered by broken towers and mouldered stones… it is the stunning impact of world history on its amazed heirs. 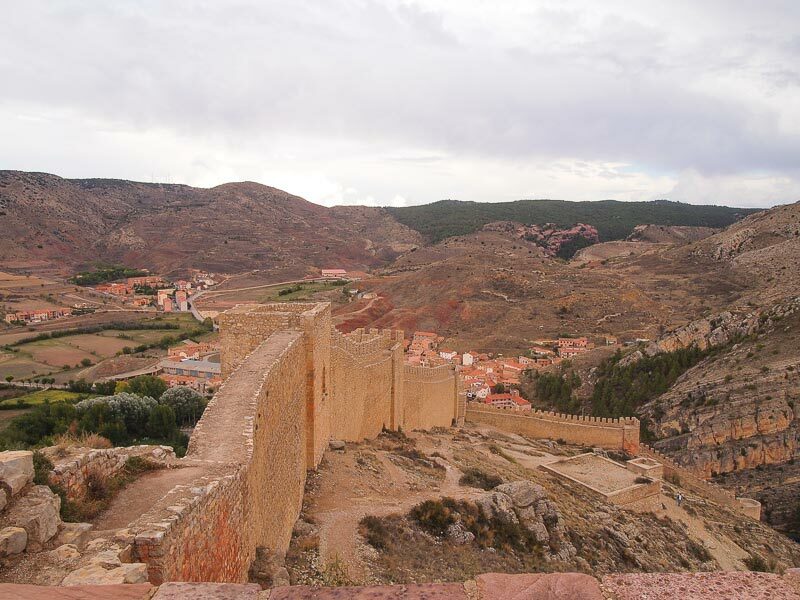 You can find out more about Albarracín Cultural Park here. The Casa del Tio Americano is named for an uncle who spent most of his life in America. Macaulay, Rose. The Pleasure of Ruins. New York: Henry Holt & Company, 1977. A 1923 classic that’s an ode to antiquity. But, as Ed pointed out today, we forgot to tell you the location: it’s in the province of Teruel,a two- hour drive northwest of Valencia; three hours east of Madrid.